Beware of wolves in sheep's clothing, and don't kill the goose that lays the golden eggs! These simple allegories -- abounding in paradoxes, ambiguities, and ironies -- embody great truths. Attributed to a legendary storyteller of ancient Greece, they speak to readers and listeners of all ages and cultures. 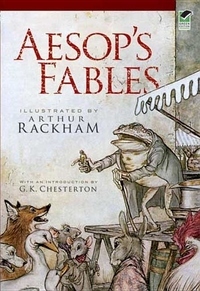 This enchanting edition of Aesop's morality tales features illustrations by Arthur Rackham. His thirteen full-color and fifty-three black-and-white images lend a perfect blend of humor and romanticism to the timeless fables. An illuminating Introduction by G. K. Chesterton complements V. S. Vernon Jones's sprightly, concise, and idiomatic translation.